How often do you brush your teeth? I will admit to not doing it enough. I should brush after every meal, but I only brush twice a day. It’s really just a habit you need to get into and having a good toothbrush will help you maintain good dental hygiene. 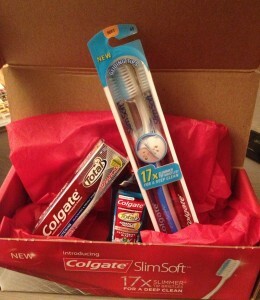 Influenster sent me a sample of the new Colgate SlimSoft to review. One thing I have heard from dental professionals is that softer brushes are best for your teeth because it’s easier on the enamel. I always seek out soft brushes in the store, but they never seem soft enough…until now. Seriously, this toothbrush is so soft and gentle. I never felt like my teeth weren’t getting clean and I’ve been using it for about a week now. Honestly, I threw out my old toothbrush after using this one. It’s the softness for which I’ve been searching. I’ve always been a fan of Colgate products. I’ve tried other toothpastes and always go back to Colgate. Now, I will also use their toothbrushes. I used to try to find the cheapest toothbrush available, but now I can see that it’s probably not a good idea. Why save $2 when you can save the enamel on your teeth for that price? You loose enamel and you can never get it back. I’ll pony up the dough.